Our gift certificates are appropriate for any occasion, or for no occasion at all, except that the special person in your life needs a little pampering. To allow full freedom to your special someone, you can purchase a gift certificate in any denomination. If you have any questions, feel free to call or email us. To purchase a gift certificate, please call or email. We'll contact you to make payment arrangements and then mail your certificate. 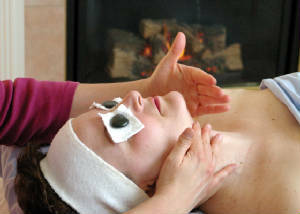 Day spa parties are perfect for girls' getaways, bridal showers, office parties, gifts, etc. Gwen and her staff will come to your location with spa robes, and provide a day of relaxation and luxury including manicures, pedicures, facials and massages. Call for pricing and planning assistance with all the details. Advanced notice required to coordinate staff and services.